A local US Congressman wants to make sure more Purple Heart recipients can take advantage of their full educational benefits. 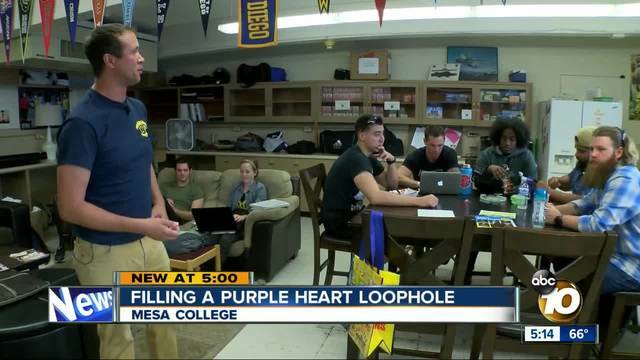 Representative Scott Peters (CA-52) said at Mesa College in San Diego Monday that upwards of 1,500 Purple Heart recipients can’t get those benefits because they did not serve more than three years in the military before being honorably discharged. “The thing about these folks is they don’t ask for much. They’re very proud. They’re proud of their service,” said Congressman Peters. The current rules state that a military veteran must serve 36 months. However, some Purple Heart veterans are honorably discharged before that time and can’t get those same educational benefits. A Peters staffer said the bill could be passed as early as this year. “I think it will sail through,” said the Congressman.